Perform a general postural assessment. It is common to see a forward head posture with people who suffer from TMJ syndrome. When looking at facial symmetry, you want to look at both horizontal and vertical symmetry. 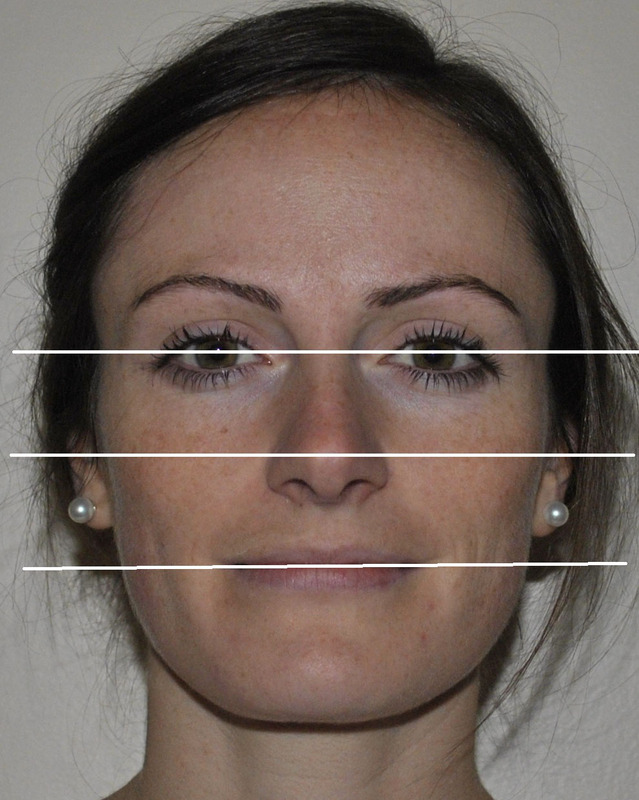 When observing horizontal symmetry, the face is divided into thirds via Bipupital (level with the eyes), Otic (level with the nose), and Occlusive lines (level with the mouth). Normal symmetry, you will see that each of the lines is parallel to each other. Abnormal symmetry will display unilateral convergence of two or more of the lines. 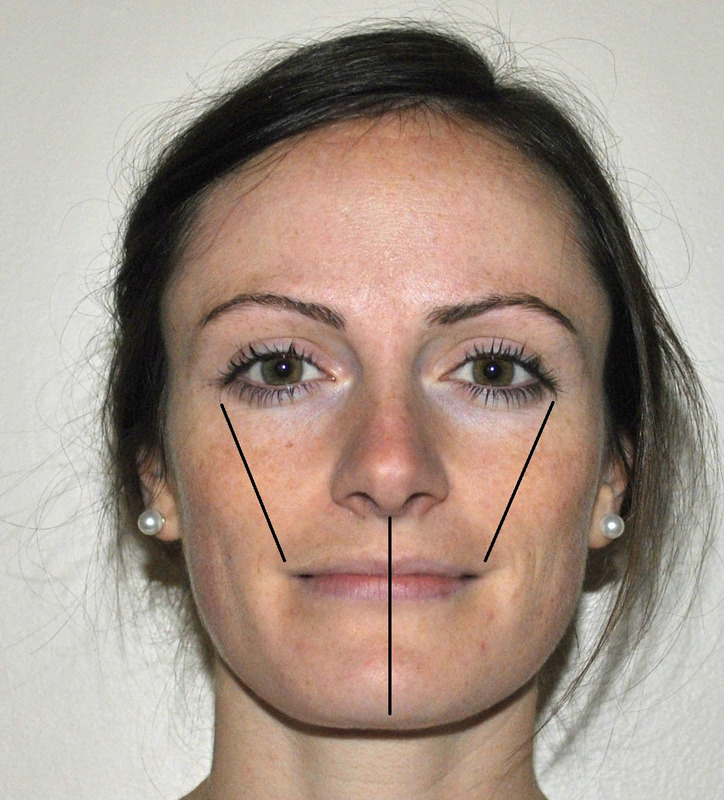 When observing vertical symmetry, two measurements should be taken: lateral edge of eye to corner of the mouth, and from nose to chin. In normal vertical symmetry, the measurement from the lateral edge of the eye to the corner of the mouth should be equal to the measurement from nose to chin. If the measurement from eye to mouth is shorter by 1mm or more, check for any facial paralysis, i.e. ptosis or Bell’s palsy. If the nose to chin measurement is shorter by 1mm or more, check for any loss of vertical dimension of the teeth, overbite, or TMJ dysfunction. Look for any signs of malocclusion (Class I Occlusion), overbite (Class II Occlusion), underbite (Class III Occlusion), and/or crossbite. Look for symmetry of the upper and lower lip, along with any signs of hypertrophy of the muscles of mastication. In some cases of TMJ syndrome, the patient will display signs of tongue thrusting, indicating possible hyperactivity of the muscles of mastication. To test this, have the patient in an upright cervical posture, and ask them to swallow—tongue thrusters will protrude the head to create the oral seal in order to swallow. Also check for the resting position of the tongue. Is the patient able to do these movements with their mouths closed? In cases where a patient presents with suspected neurological symptoms such as numbness, tingling, burning sensations, weakness or CN symptoms included below; a full neurological exam is indicated. This includes testing the jaw reflex, cranial nerves, and relative cutaneous distributions. CN1 (Olfactory Nerve) Have the patient smell coffee or a similar substance with one nostril at a time and with their eyes closed. A positive test would be anosmia (loss of smell). CN2 (Optic Nerve) Patient and examiner will face each other and the patient will cover one eye at a time for the test. The examiner moves their hand or a bright object from the periphery of the right and left visual fields (top, bottom, side, and corners) A positive test is a loss of visual field in one or both eyes. CN 3 (Oculomotor Nerve), 4 (Trochlear Nerve), 6 (Abducens Nerve) (a) Visual Fixation Test: examiner makes an H with their finger while the patient tracks the movements. (b) Convergence Test (Oculomotor exclusively): hold finger in the middle of the bi-ocular field and slowing move finger toward the patient. (c) Consensual Reflex (Oculomotor exclusively): have patient cover ipsilateral eye while the examiner observes the contralateral eye. Observe contralateral eye as the patient uncovers the ipsilateral eye. Test both sides. (a) A positive test would be an inability to track, nystagmus, or an inability to raise one/both eyelids. (b) A positive test would be the inability of one eye to adduct. (c) A positive test is indicated as the ipsilateral eye is covered, and the contralateral pupil does not dilate. In addition, as the ipsilateral eye is uncovered, the contralateral pupil does not constrict.— Positive symptoms for CN 3, 4, or 6 include visual disturbance or diploplia. 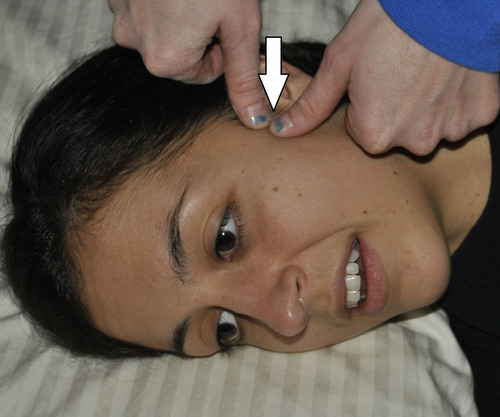 CN V (Trigeminal Nerve) To test CN V, sensory testing is performed with a toothpick bilaterally just off midline at the forehead, nose, and chin. Positive symptoms include facial paresthesia, anesthesia, or headaches. 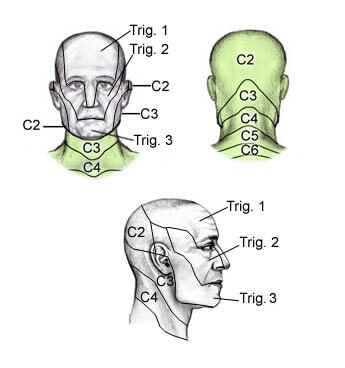 CNVII (Facial Nerve) (a) Taking a subjective history. (b) Observations. (c) Facial Strength Test- assess the lower facial muscles with smiling, whistling, baring teeth, and puckering lips. The upper facial muscles can be assessed by closing eyes and wrinkling the forehead. (a) Positive symptoms include hyperacusia (hypersensitivity to high frequency sound), dsygeusia (taste disturbance). (b) Positive observations include abnormal facial expression, mobility, and symmetry. (c) A positive test is indicated if there is weakness of contralateral supraorbital and infraorbital muscles. CNVIII (Vestibulocochlear) (a) Cochlear Division: Finger Rusting Test- examiner rubs finger and thumb together and moves closer to the patient’s ears. The patient is instructed to tell the therapist when they can hear the sound in each ear. (b) Vestibular Division: Patient sits at the edge of table; examiner supports the occiput and upper trunk with one hand and forehead with the other. With patient’s eyes opened move them side to side, forward, backward, and in circles in both directions. If a positive test is found, repeat with the patient’s eyes closed. (a) A positive test is indicated when the patient hears the rustling finger better in one ear compared with the other. (b) A positive test is indicated if the patient complains of dizziness or has nystagmus. CN IX (Glossopharyngeal Nerve) Gag Reflex Test Not performed in PT clinic. CN X (Vagal Nerve) Phonation Test- PT instructs the patient to open their mouth wide and say, “ahhh,” while observing the uvula. In a positive test for unilateral paralysis or paresis, the uvula and median raphe of the palate move toward the intact side and the posterior pharyngeal wall of the paralyzed side move like a curtain toward the intact side. XII (Glossopharyngeal Nerve) Have patient stick out their tongue. A positive test is indicated if the patient deviates to affected side; with lower motor neuron pathology, atrophy, fasciculation, or tremors may be observed. This reflex is considered the reflex of TMJ. The examiner places their hand on the chin of the patient while the patient is in a rested position with their mouth open. The test should be done with patient’s eyes closed to prevent tensing up. The examiner then taps their thumbnail with a small reflex hammer. A normal reflex is to close the mouth and is a test of CN V.
Description: an examiner can listen to the temporomandibular joint movements as the patient opens, closes, laterally deviates to the left and right, or protrudes the mandible. The examiner is listening for abnormal sounds. A normal sound would be a single, solid sound heard with closing the mouth as the teeth “hit” simultaneously. A slipping sound with occlusion is considered abnormal. Clicking with opening and closing the mouth is the most common joint noise and is considered abnormal. Clicking is clinical evidence that the condyle is slipping over the disc and then self-reducing. The later a click occurs upon opening, the more anterior the disc travels, and this may lead to the jaw locking with opening. The first click is during opening while a second, quieter click may be heard with closing. A click with closing is indicative that structures attaching to the condyle are mobile. Clicking may indicate a hypermobile joint. Crepitus with joint movement usually indicates degenerative changes within the joint or a perforation of the disc. If pain occurs with crepitus, this usually means the disc has eroded. Movements of the joint would cause the condyle and temporal bone to rub together where the disc has been eroded and causes pain. Each movement should be repeated several times to ensure a correct diagnosis. This test is used to detect pathology involving CN VII. 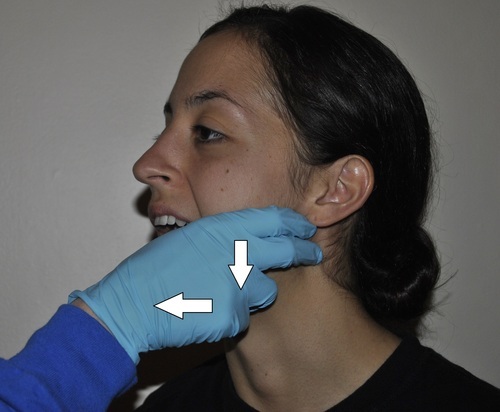 Examiner Action: using the index finger, tap the parotid gland overlying the masseter muscle. Positive Test: muscle twitch may indicate CN VII pathology. Pain on any of the following movements may indicate an articular problem or pathology to the retrodiscal structures. The examiner should wear rubber gloves with these tests. Patient Position: seated with a neutral head position, mouth slightly open. Examiner Hand Position: thumb on patient’s lower teeth inside the mouth with the index finger on the mandible outside the mouth. Examiner Action: Push down with the thumb and pull down and forward with the index finger while the others push against the chin as a hinge point. This causes a distraction of the mandible. Assess bilaterally. What to feel for: tissue stretch of the joint. Patient Position: supine, mouth slightly open and the mandible relaxed. 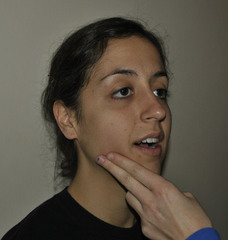 Examiner Hand Position: thumb inside the mouth along the medial side of the mandible and teeth. Examiner Action: Push thumb laterally and the mandible glides laterally. Assess bilaterally. What to feel for: lateral glide of the mandible. Patient Position: side lying with mandible relaxed. 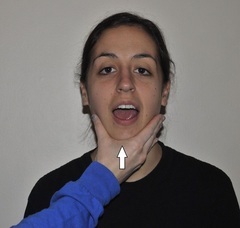 Examiner Hand Position: place thumb (or overlapping thumbs) over the lateral aspect of the mandibular condyle outside the mouth. Examiner Action: apply a medial pressure to the condyle, gliding the condyle medially. Assess bilaterally. What to feel for: medial glide of the mandible. Examiner Hand Position: place thumb (or overlapping thumbs) over the anterior aspect of the mandibular condyle outside the mandible. Examiner Action: apply a posterior pressure to the condyle, gliding the condyle posteriorly. Assess bilaterally. What to feel for: posterior glide of the mandible. This test is used to assess the anterior displacement of the TMJ disc. Examiner Action: place a cotton roll between the back teeth of the patient’s unaffected side. Instruct the patient to bite down forcefully. Assess bilaterally. Positive Test: pain upon biting down indicates anterior disc dislocation. 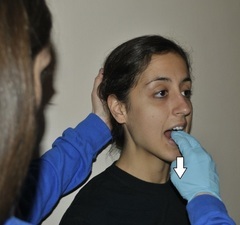 Modify: if the patient experiences pain prior to the action of the exam, instruct them to chew on the cotton roll rather than forcefully bite down. 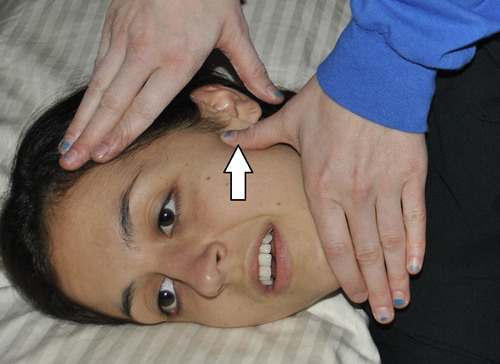 However, this method is not as specific to the anterior disc, but it indicates TMJ involvement. 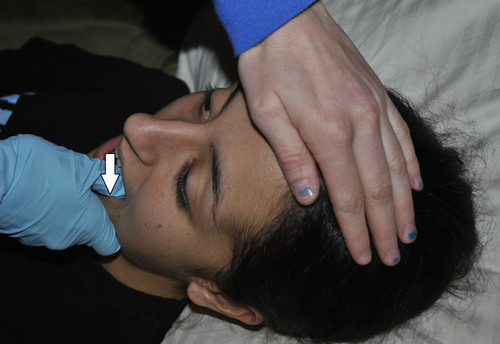 Any positive found in this test may indicate inflammation within the synovium of the TMJ. Examiner Position: stand facing the patient with his or her fifth digit fingers in the patient’s ears. Examiner Action: instruct the patient to open and close the mouth while applying an anterior force with the pads of the fifth digit. Assess both sides at the same time. Positive Test: pain or discomfort may indicate inflammation within the TMJ synovium. 1. Magee DJ. Temporomandibular Joint. In Magee DL . Orthopedic Physical Assessment. 5th ed. St. Louis, Missouri: Saunders Elsevier; 2008: 203-230. 2. Dimitroulis G, Dolwick MF, Gremillion HA. Temporomandibular disorders: clinical evaluation. Aust Dent J. 1995; 40: 301-305. 3. Trott PH. Examination of the temporomandibular joint. In Grieve G (ed). Modern manual therapy of the vertebral column. Edinburgh: Churchill Livingstone; 1986. 4. Ingawale S, Goswami T. Temporomandibular joint: disorders, treatments, and biomechanics. Ann Biomed Eng. 2009; 37(5):976-96. Page created by Tara Ata and Theresa Horsch.